Today is the day of feeling enormous proud and celebrating unity for India. The ‘Iron man of India’, Sardar Vallabhbhai Patel was born on today in 1875. On his 143rd birth anniversary today, Prime Minister Narendra Modi has unveiled the Statue of Unity. The Statue stands tall near Narmada River in Gujrat entitling the record of being the tallest statue in the world. The statue of the father of the Republic of India has been built at a cost Rs. 2989Cr. The statue is made of 1,40,000 cubic meters of concrete, 18,500 tons of reinforced steel rods, and 2000 tons of bronze sheets. Padma Bhushan awardee Ram V. Sutar has designed the statue. He has designed over 50 monuments in his lifetime. But he took extra care in the case of this statue so that Sardar Patel’s face was as accurate as humanly possible. For that, he went through 2000 photographs of Sardar Patel. He even consulted historians and people who had seen him in person. Sardar Patel’s statue has been designed to make it look like he is walking on Narmada water towards the Sardar Sarovar dam. 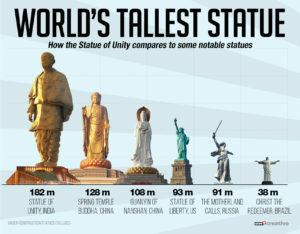 Sardar Vallabhbhai Patel will stand at twice the height of Statue of Liberty. At 182 meters (600 ft), the Statue of Unity is the world’s tallest statue right now. It has been built to withstand wind speeds of up to 60 m/sec, which is expected at a height of 182m. In addition to that, it can also withstand an earthquake of up to 6.5 Richter. Then CM of Gujrat Narendra Modi announced the statue in 2010 and now it has been inaugurated by the Prime Minister Narendra Modi, isn’t it interesting? The first foundation stone for the Sardar Patel statue was laid in 2013. It took 33 months and 3000 laborers to be built. The Statue of Unity has two high-speed elevators for passengers, to take visitors to its viewing gallery. The viewing gallery which is at a height of 153m can accommodate 200 tourists at a time. Apparently, there are 139 statues that are 30 meters or higher in the world. Out of that, 42% have been built by either China of India. China leads this race with 34 statues, while India is at 25. The IRCTC will flag off the Unity Express today from Rajkot on the inauguration of the statue. The train will run for a total of 12 days. Its boarding stop will be Rajkot, Surendra Nagar, Viramgam, Sabarmati, Anand, Vadodara, Bharuch, Surat, Vapi, Kalyan, and Pune.